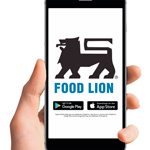 "With the launch of the Food Lion Mobile App, we strive to make it easy to shop while making it even easier to save"
SALISBURY, N.C.--(BUSINESS WIRE)--Today, Food Lion has launched a new mobile app to make grocery shopping, and saving, easier for customers across its 10-state footprint. Shoppers can explore new ways to save with each feature, from the convenient digital MVP card, to digitized weekly ads. The Food Lion app includes an easier way to decide what's for dinner with a recipe finder and digital shopping lists. Customers can also load coupons to their MVP card. In an average month, Food Lion offers more than $250 worth of MVP Load to Card Coupons available through the mobile app and www.foodlion.com. iPhone and Android customers can download Food Lion's new mobile app for free in the App Store or Google Play Store. For more information, visit www.FoodLion.com/mobile. Shopping and saving are now easier with the new Food Lion mobile app. App features digital MVP card, loadable coupons, recipe finder and more.